Save money by buying your food in bulk and eat great! Click image for PDF Printable Poster. 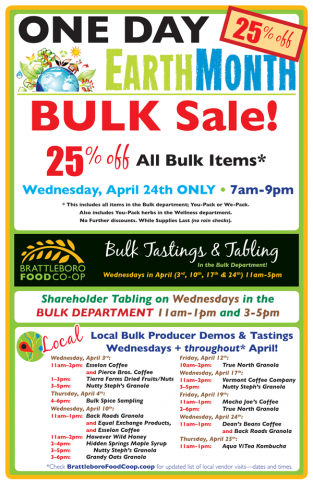 Join us in April to celebrate Earth Month in the Bulk Department! 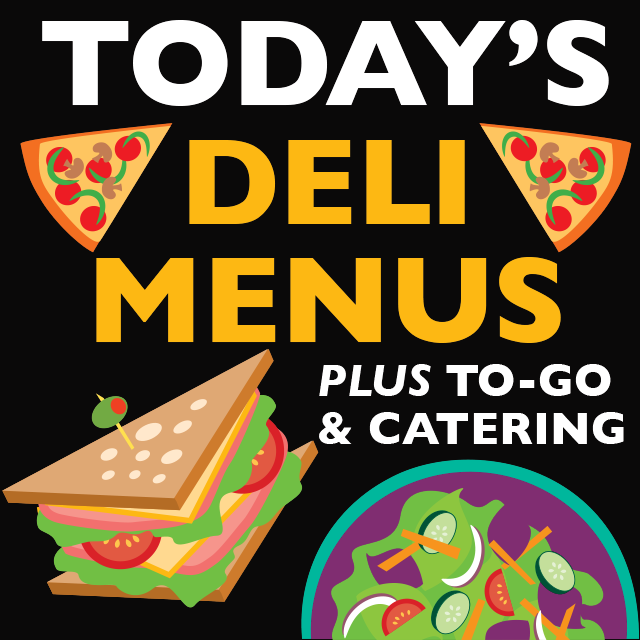 During the month of April we will have Local Bulk Department Producers visiting the Co-op to offer tastings of the products we sell in bulk every day. Meet the folks who run these farms and businesses and taste local granolas, local maple syrup (2019 batch just arrived), local honey, local coffee, local kombucha, and other locally sourced products available in the bulk department. There will also be tastings and instructions throughout the month with regard to cooking and using staples which are available in bulk, such as a variety of rice, beans, and spices. 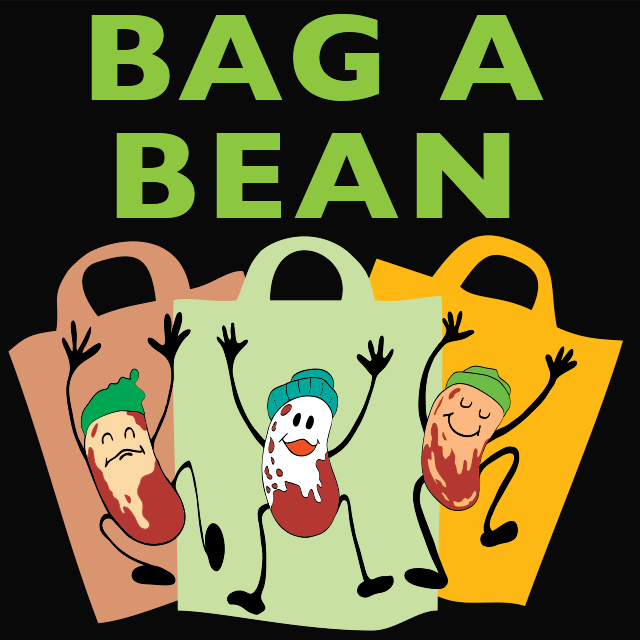 Shareholders will be tabling in the Bulk Department on Wednesdays in April from 11am to 1pm, and from 3pm to 5pm. They are there to help customers understand the bulk buying process better and to talk about the products the Co-op sells. For instance, there is a common misconception that buying in bulk means buying large quantities of a product in order to save money. That may be so at big box stores, but buying bulk at the Co-op means you can purchase as little or as much as you want, or need, at a ‘bulk’ price, which is often less expensive in unit price than prepackaged products. Another point of conversation is about reusable containers, jars, and bags; how we use them and how we can do our part in saving our planet’s resources by reusing and recycling. Less packaging means less waste, so bring your re-usable containers and your questions to our tablings. Spice up your cooking with a wide variety of shelf stable foods whilst slowing down our waste stream. Lastly, be sure to plan a Bulk Department shopping trip on the 24th! All items in the Bulk Department, and the Wellness Department’s Bulk Herbs will be on sale for 25% off. This is a great time to restock your pantry and spice shelf! So many choices! Try a snack, as much or as little as you need: chocolate covered __________ (fill in the blank, we probably have it), nuts, trail mixes, sesame sticks, or jelly beans! And, of course, nearly every color of beans and peas, flours of all types, sugars, salts, quinoa, soup mix… we’ve got it going on here at the BFC Bulk department. Don’t forget your herb and spice needs; we have a huge selection, from allspice to za’atar! Or, maybe you like to browse the coffee bins or the dried fruit confections. Buying in bulk allows you to bring in your containers, which will get you a nickel off, and save some waste. If you forget your jar, we have some of those too, or you can, of course, grab a bag. Come marvel at the beautiful options in the bulk bins! You won’t believe your eyes. Buying in bulk is a way to save money and eat well! 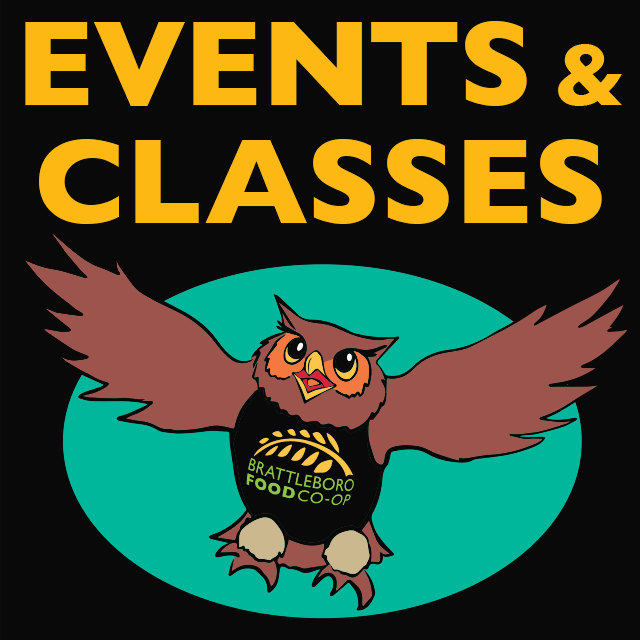 Email: DanR@brattleborofoodcoop.coop or send us a note using our Contact Form!